Today I have a wickedly good green for you - from the Ghouls' Night Out collection from China Glaze, it's Drink Up Witches which is such a great pun. 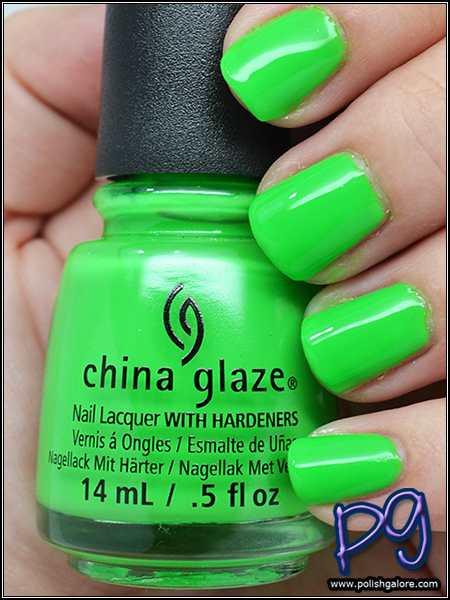 This neon green polish leans more yellow green but thankfully, no staining. I cannot deal with stainers right now. I used a base coat of Duri Rejuvacote, 3 coats of polish and finished with Glisten & Glow H K Girl top coat. Now neons are normally matte by nature, but this polish seemed shiny even without the top coat. I added it for protection of course. As for the formula, it was a little thin, and that's why I needed 3 coats and then I had to be sure not to bubble it up on the nail, as the formula wanted to run down the brush and glob on. 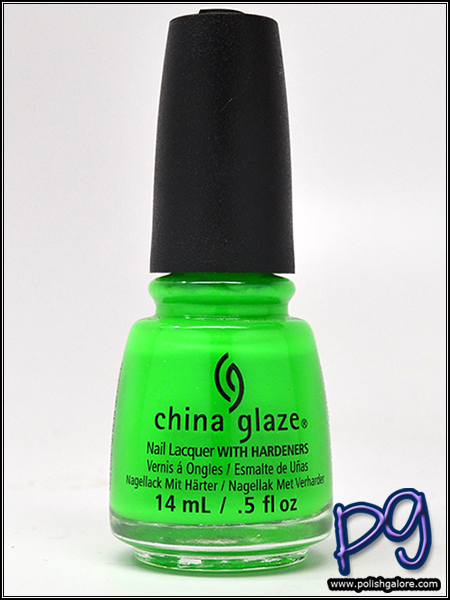 China Glaze can be hit or miss on some of their formulas and this was definitely a watery one. I did not use a white base coat on this polish but just LOOK and see how it glows! I'm a little messy - my right hand is in a wrist brace for now, so polishing is a little difficult, but you can always clean up with some polish remover and a small brush. I'm still using my trusty e.l.f. "concealer" brush that I got for $1, but I can't seem to find it in stores anymore so I hope it lasts a good long while. This one has lasted over a year. Back to the polish - it's just eye searing greatness.